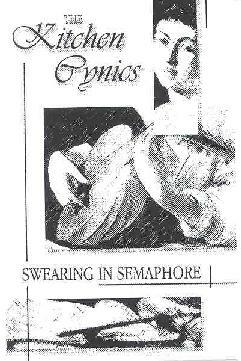 The Kitchen Cynics - "Swearing In Semaphore"
The Kitchen Cynics are actually a solo effort by a gent named Alan Davidson. Side A of the cassette consists lo-fi psychedelic songs while Side B has a mixture of traditional medieval/Celtic tunes and some bluesy rockers. Songs like "The Place You Bid" and "Grown Up In Monochrome" have a lo-fi pop-psych feel, both featuring a cool flute sound. I love the trippy flute on "Grown Up In Monochrome" and even the harmonica has a psychedelic sound. And "The Place You Bid" gets my vote for best melody of the set. "Aye Aye, Well Well" and "North Of Balmedie, West Of The Waves" are folky pop-psych tracks that I enjoyed. Balmedie in particular features a classical guitar pattern and trippy guitar licks. And "Best Kept Secret" is almost like a 60's Turtles tune, but heavier on the psychedelic side. In somewhat different territory are "At Villa E 107", "The Day That Love Turned Green", and "Tracy E's Love Song", all with a Celtic and/or Medieval sound. "At Villa E 107" was my favorite of this style being a traditional sounding Celtic folk song played in a raw simplistic style. "Don't Spit On Me", "On That Bill Again", and "Hard To Be Happy" are the rockers of the album. "Don't Split On Me" is a garage guitar and synth tune. It's Davidson's own song but he does mention stepping on his Blue Suede Shoes... rock 'n roll nostalgia. Love it. On "Great Discovery" we start to trip out a bit more. The song starts with a thudding line that made me think it might be a cover of Pink Floyd's "One Of These Days". But then it goes off into a freaky guitar and synth tune. And finally, "The Rituals" is an oddball song. But listen closely and there's some cool spacey guitar lines and Residents-like synths. A simple but enjoyable set. Swearing In Semaphore is distributed by Best Kept Secret. You can visit their web site. Contact via snail mail c/o Alessandro Crestani; Via Biron di Sotto; 101 - 36100; Vincenza; Italy. Contact The Kitchen Cynics at 346 Holburn Street; Aberdeen; AB10 7GX; UK.